One of our customers from Australia, Ashley Miller, was in town here for vacation this month and dropped by the shop on a couple of occasions. Ashley is very friendly, savvy and enthusiastic RV-10 owner. 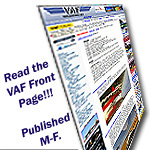 He designed the RV-10 dual coil mount for -10s that we sell. It was really great to meet him in person and get the scoop on RVs and GA in Australia. We don't know how easy we have it here in North America with our massive aviation vendor base, kit makers, engine builders, GPS data bases and numerous airports etc. Almost everything has to be shipped from afar (very afar) regarding airplane stuff. This makes it slow to obtain and expensive just from a shipping standpoint. Distances between refueling stops can be huge so range and fuel economy are important. We've sold a fair number of systems in Australia and NZ over the last 10 years or so and Ashley has helped spread the SDS name down under in recent years even more. We really appreciate his efforts and hope to work more with him and other folks in Australia in the future. They are a tight knit group, freely sharing resources and knowledge with each other to promote Experimental aviation there. They have some great brain power and are working on some aero mods to eke out a few more knots or a few more MPG. Looking forward to seeing those tested. In my past dealings with Aussies, I formed the impression that they are friendly, no nonsense, get to work types. Ashley is just like my impression, with a limitless dose of energy to boot. I am looking forward to a trip to Australia next year to meet some clients and see the land very much. Ashley has generously agreed to show me their local operation and put me in touch with others down there. In the distant past, I would design electronic assemblies to fit in the Canada Post Light Packet or Small Packet categories. This was so economical that I offered free shipping anywhere in the world! Times are different now, but the same principles apply. The lesson learned is that product design includes all aspect of the customer experience. Desser tire, for example offers free shipping by wrapping the tires in plastic wrap and sticking on a shipping label. Clever. I'm not implying criticism of any sort here, but just want to point out that my customers in Europe, South Africa and Australia sure liked the free shipping! I made a little less but gained customer loyalty. Thanks for the kind words,it sure was fun catching up with yourself and Barry. Calgary and Canada in general is a very beautiful part of the world. The depth of knowledge and experience that you and Barry bring to the EFII world was like drinking through a fire hose. Looking forward to all the new products that SDS will bring to the market in the coming years. It was great to catch up with Les Keaney and to see his IO-540 EFII install on his new RV-10, one very good looking Aerosport EFII IO-540 ! We have a growing community of EFII installs in RV-14's and RV-10's underway in Australia at present as more and more customers embrace the new technology. Many more are removing one or both mags and fitting CPI units. Ashley has some ideas for bulk shipping of popular items from North America and other places over to Australia to try to reduce some of these costs, fitting in with their RV community concept. While small items like a PCB might not kill you on cost, complete RV kits certainly do. As December begins, I wanted to thank all the folks from VAF who've supported us this year by choosing SDS products for their RVs. By the end of this week we'll have received several hundred more CNC'd parts, pushing us over 35,000 machined assemblies in total over the last 20+ years. We plan to introduce some more aircraft specific parts next year which are already on the drawing board but didn't make it to production yet as our machinists try to finish the current orders. TS Flightlines and Aircraft Specialty has worked with Ross and SDS on several installs, including an IO-550 Continental with a supercharger. NOPE, not and RV, but a cool install nevertheless. The quality of the SDS products speak for themselves. Great job Ross, and Merry Christmas!